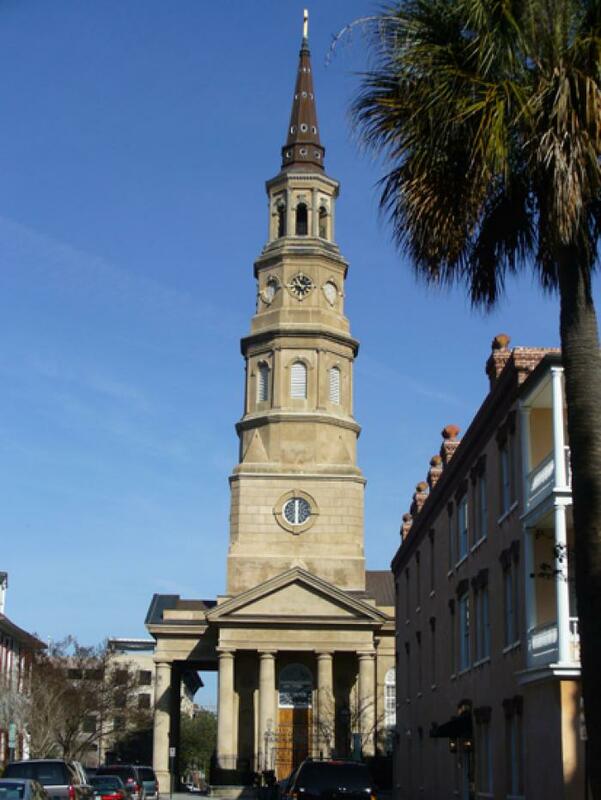 The present church building is the third structure to house the oldest congregation in South Carolina (established 1681). The building, without the steeple, was designed by Joseph Hyde and constructed by 1836. The spire was designed by Edward Brickell White and constructed between 1848 and 1850. The church is stuccoed brick with a single tier of windows on either side. There are three Tuscan porticos. The interior has a high vestibule, is in the style of an auditorium with high Corinthian arcades, a plaster barrel vault, galleries and an apsidal chancel. There are notable wrought-iron gates to the front of the building. The chancel and apse were altered, after a fire in 1920, by Albert Simons, architect. The spire is set upon a square stuccoed brick base with oculi; the steeple is octagonal with pilasters and oculi; the octagonal spire is capped with a weather vane. The imposing tower, perhaps massive for the portico beneath, is appropriately in the Wren-Gibbs tradition. Listed in the National Register November 7, 1973; Designated a National Historic Landmark November 7, 1973.